Click here to see pictures more pictures. In March 2018, we dedicated the library and honored Worshipful Brother Lyle Van Outer, Chair of the Library Committee, for his dedication and work in bringing the new library to fruition, by naming the room, The Lyle Van Outer Masonic Library. Click here to learn more. Click here to learn more about what Freemasonry is really about. 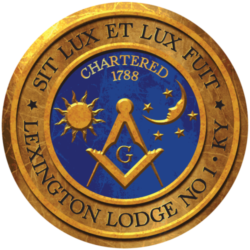 Click here to access our online members area for Lexington Lodge No. 1 members only. Lexington Lodge No. 1 Meets on the 1st and 3rd Monday of Each Month. Fellowship Meal at 6:30 p.m. Stated Communication at 7:30 p.m. Preferred Dress: Coat and Tie.